[ First edition inscribed by the author to dedicatee John Carter. ] Minding My Own Business. An Autobiography. + 224pp., 8vo. Seven plates. A good tight copy, on lightly-aged paper, in blue cloth binding and worn and aged dustwapper with nick at head of cover. Inscribed on front free endpaper: 'For John | affectionately | from the Author.' The book is dedicated 'To J. W. C. affectionately', and it contains numerous references to him. Loosely inserted is a cutting of Michael Sadleir's warm review of the book in the Sunday Times, 24 June 1956. [ John Loder, English stage and Hollywood actor. ] Black and white studio photograph by Cyril Leeston of London, showing Loder in costume of the film 'Java Head' (1934), with signed inscription by Loder to 'Mrs. Wright'. Stamp on reverse of Cyril Leeston, London. Undated (1934). A black and white print, 24 x 19 cm. In good condition, lightly aged and worn. Shows Loder in top hat and nineteenth-century frock coat, with cane. Inscribed: 'To Mrs. Wright | With sincere good wishes | from | John Loder.' In pencil on reverse: 'Capt. William | Java Head | J. K. 67 | For Mrs Wright | Stills'. Stamped on reverse: 'CYRIL LEESTON | LONDON | TELEPHONE 3884 PADDINGTON'. This image is not in the National Portrait Gallery collection, nor is any other by Leeston. Perth [Scotland]. 29 July 1813. 1p., foolscap 8vo. In fair condition, aged and with traces of previous mount on reverse. On laid paper with watermarked date of 1810. Laid out in landscape within ruled lines. Returns for '10 Companies', with 19 columns (totalling 1456 individuals), gathered into sections for 'Commissioned Officers', 'Staff Officers', 'N[on]. C[ommissioned]. Officers' and 'Rank & File'. In bottom left-hand corner: 'one Captain on leave | one Lieutenant Sick | 1 Major & 2 Captains supernumerary | 1 Lieut. & 2 Ensigns wanting'. [Catalogue by Elkin Mathews Limited.] List 71. A Small Collection of Children's Toys and Games. + 8pp., 8vo., with an additional 6pp of illustrations. Aged and creased, with rusted staples. Typeset with something akin to an IBM golfball. Introductory note: 'This small collection of children's toys and games was formed in the early years of this century and had remained undisturbed in a packing case until purchased by us some months ago. Some of the toys show signs of use but in general the condition is very good. Adequate description is difficult and we have endeavoured to illustrate as many of the toys as possible. The first four numbers of 'The New Athenian Broadsheet'. No.1, 'Festival Issue - Scottish Poems of Place'. No.3: 'Spring and Summer Poems'. No.4: 'Scottish Lore and Legend'. No.1: August 1947; No.2: Christmas 1947; No.3: April 1948; No.4: July, 1948'. 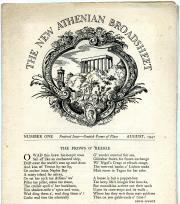 All printed for 'The Editor, The New Athenian Broadsheets, 45 Plewlands Gardens, Edinburgh, 10' by The Favil Press Ltd., 152 Kensington Church Street, London. All four items printed on both sides of a piece of paper roughly 57 x 25 cm, folded twice to make 6 pp, each 19 x 25 cm. Aged and a little grubby and creased. The second number with title printed in red, the third with title in green, and fourth with title in blue. Each with engraving of park with neo-classical buildings by William McLaren. No.1: poems by Lewis Spence, R. L. Cook, Joe Corrie, W. H. Hamilton, Alexander Buist, A. V. Stuart, Hugh N. Maclachlan, A. A. C. Blackie, Dorothy Margaret Paulin and Helen B. Cruikshank. 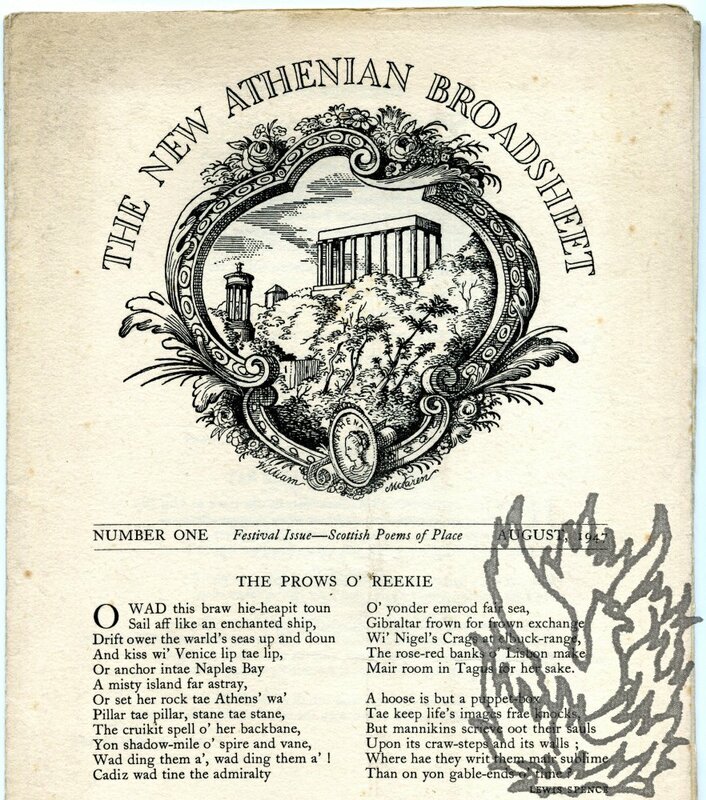 No.2: poems by William Soutar, Alexander Buist, A. V.